On July 13, 2018, about 1800 eastern daylight time, a Cessna 182T, N291CP, was substantially damaged during takeoff from Geneseo Airport (D52), Geneseo, New York. The commercial pilot sustained serious injuries and the two passengers sustained minor injuries. The airplane was operated by the Civil Air Patrol (CAP) as a familiarization flight conducted under the provisions of Title 14 Code of Federal Regulations Part 91. Visual meteorological conditions prevailed and no flight plan was filed for the local flight. The pilot reported that earlier during the day of the accident, he completed a flight from Greater Rochester International Airport (ROC), Rochester, New York, to D52 uneventfully and did not use the autopilot during that flight or the accident flight. The purpose of the accident flight was to provide a familiarization flight to two CAP cadets. The pilot showed the cadets a thorough preflight inspection and then started the engine and taxied to runway 23. Prior to takeoff, the pilot performed an engine run-up and verified that all flight controls were free and correct. The pilot then initiated a soft-field takeoff procedure on the bumpy grass runway. The airplane became airborne in ground effect about 45 knots and everything seemed normal as it began to climb out of ground effect at 60 knots. At that time, the nose pitched up abruptly and the pilot pushed the yoke forward as hard as he could while engaging nose-down electric elevator trim; however, the airplane continued to climb at an excessive angle-of-attack and stalled. It subsequently rolled left, descended to the ground and came to rest inverted. Both passengers were minors and interviewed separately by a Federal Aviation Administration (FAA) inspector in the presence of a parent. One passenger did not recall the pilot doing a preflight inspection, use a checklist, or perform any type of check and engine run-up prior to takeoff. The other passenger recalled an abbreviated preflight inspection and use of a checklist before and after engine start; however, he did not recall any stopping prior to entering the runway, engine run-up, or control check except for flaps moving. Both passengers sustained concussions in the accident. 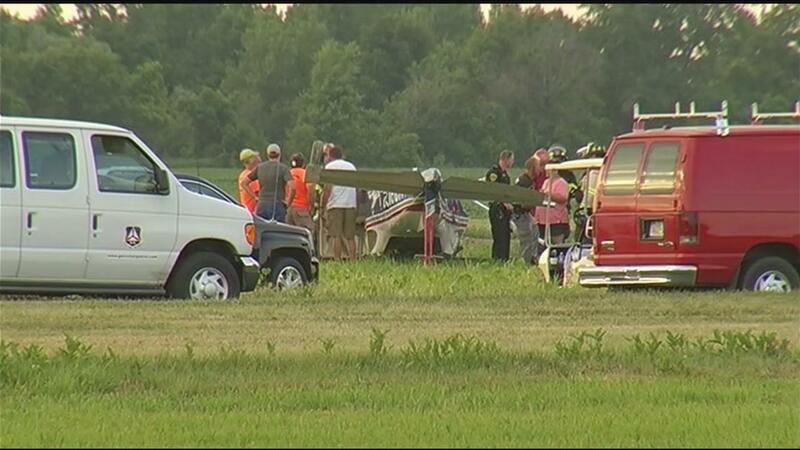 Initial examination of the wreckage by an FAA inspector revealed damage to both wings and the fuselage. The inspector measured the elevator trim actuator arm, which corresponded to a 10° tab-up (nose-down) trim position. The maximum tab-up position was 24°, plus or minus 2°. The inspector also recovered a memory card from the airplane's multifunction display; however, download and review of the data revealed that the last recorded flight was in 2016. The wreckage was subsequently up-righted and recovered by the operator. The FAA inspector examined the wreckage again with a representative from the airframe manufacturer. All control surfaces were moveable by hand. All flight control cables were intact and attached to their respective flight and cockpit controls except left aileron cable, which had separated between the front door post and instrument panel, in the area of the fuselage separation. The separated ends of the left aileron cable exhibited a broom-straw appearance. The rudder and elevator cables and their routing area were visually examined throughout the length of the airplane. The elevator and elevator trim autopilot servos could be moved by hand. No preimpact impediments to the movement of the control yokes were observed between the firewall and instrument panel and no preimpact abnormalities were observed during the examination. Review of the operator's "Before Takeoff – Run-Up" checklist revealed, "…20. Elevator & Rudder Trim…Take Off…"
The recorded weather at ROC, at 1754, included wind from 220° at 7 knots, visibility 10 miles and scattered clouds at 14,000 feet. Waiting for final report. However, it looks like a piloting error. Glad the youngsters are ok. This type of situation should not be occurring period. If you go back and look at most other CAP accidents, a pattern of pilots errors is evident. At a very high cost to taxpayers. My experience with CAP at our airport has been similar. They make amateur mistakes nearly ever time they fly. Theirs got to be something than can be done to change the situation. EAA Young Eagles program to promote aviation to youths.